This Alpine White BMW E90 4-door 335i came by to have me vinyl wrap his chrome / brushed aluminum window trim with my matte black vinyl material. In addition to doing his window trim, I also wrapped his roof with the 3M di-noc matte carbon fiber finish to really set off the car. 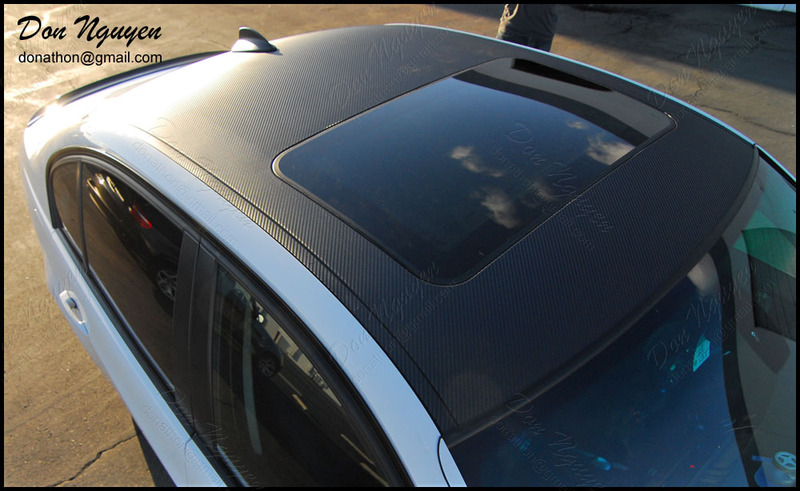 We had the antenna fin cover painted matte black, which went fairly well with the matte finish of the roof. The matte black window trim and matte roof also ties in together nicely. Also as a reference point, the trunk spoiler is real carbon fiber. From further away the carbon fiber finish looks more of a solid matte / flat black finish, but as you get closer to the car/roof, the carbon fiber weaves/design becomes more visible, which is also another nice subtle touch/look.